UAE fire safety systems & equipment market can be broadly categorized into- Fire safety systems & equipment market types include fire protection systems & equipment (fire extinguishers, fire suppression systems, fire pumps and fire pumps & controllers), fire detection systems & equipment (smoke detectors, heat detectors, flame detectors, gas detectors and emergency lighting & alarm systems) and others (bladder tanks, valves & risers, backpack/ portable fire safety equipment, fire cabinets, CAF systems and fire sprinklers. The report thoroughly covers the market by fire safety systems & equipment types, sub-types, by verticals, by regions and competitive landscape. The report provides unbiased and detailed analysis of the on-going trends, opportunities/ high growth areas, market drivers, which would help stakeholders to device and align market strategies according to the current and future market dynamics. 16.3	EI du Pont de Nemours and Co.
16.4	Emirates Fire Fighting Equipment Factory L.L.C. UAE is one of the leading markets for fire safety systems & equipment in Middle-East region. 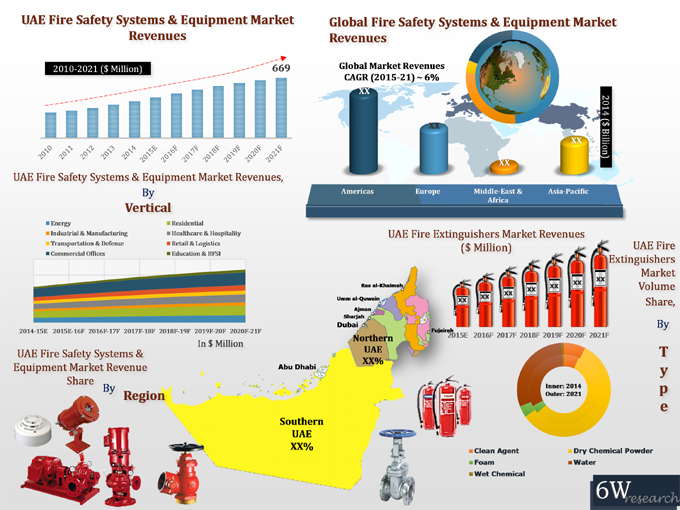 UAE fire safety systems & equipment market is buoyed by changing technology, increasing safety concerns, fire incidences, growing construction market and increasing penetration of safety equipment for both commercial & residential verticals. Over the last four years, residential vertical registered higher growth in terms of deployment of fire safety systems & equipment, prior to 2012 mandating of installation of fire safety systems & equipment by the UAE government. For residential vertical market, Abu Dhabi Emirate is emerging as key growing region in UAE market. In terms of region share, Northern region which includes Ras al-Khaimah, Umm al-Quwain, Ajman, Sharjah, Fujairah and Dubai Emirates captured majority of the revenue share in UAE's fire safety systems & equipment market. Additionally, in the overall UAE fire safety systems & equipment market, fire detection systems & equipment sales dominate over fire protection, which included smoke & heat detectors followed by fire extinguishers. Upcoming World Expo 2020 in UAE would proliferate the demand for fire safety systems & equipment owing to major construction projects over the next six years. The major companies in UAE Fire safety systems & equipment market include- NAFFCO, FIREX, UTC Fire & Security, Al Arabia For Safety & Security, Bristol Fire Engineering, Dafoos Group, Unisafe Fire Protection Specialists, Honeywell, New Age Company, Viking Arabia, Tyco Fire & Security and DuPont.